A wooded lot along a secluded lake, a parcel of land in great hunting territory, or just a few acres in the country with a permanent campsite to park a camper, trailer or motor home can offer the perfect getaway for families that love the outdoors. Such sites don't come with the electricity, water and sewer hookups typically found in larger campgrounds. You can haul water, and a generator can supply electricity, but most states or counties require a waste-treatment system to handle sewage and waste water. A properly installed septic system will be needed. Locate a suitable site on the property to install the system. County codes will dictate the minimum size of the drain field for the system in square feet, but there is no mandatory shape. For example, if the requirement is for 600 square feet, a 20- by 30-foot area would work, as would a 15- by 40-foot area. Purchase the supplies needed. 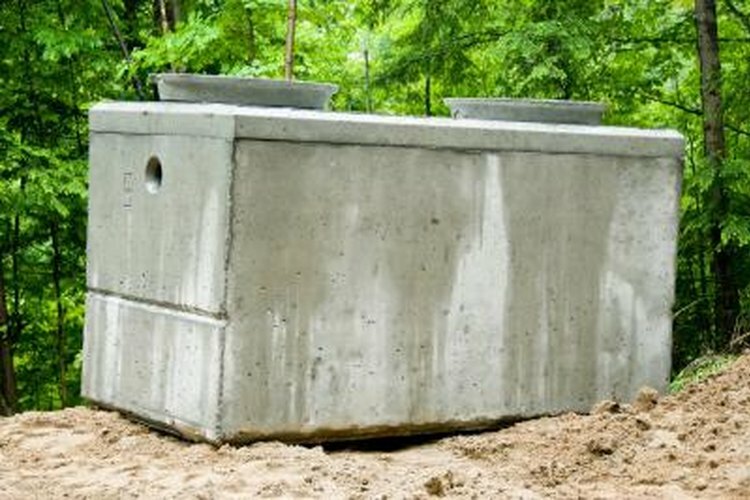 The size of the septic tank, amount of drain tile and gravel required will depend on the codes and specifications to which the system is being built. The amount of sewer pipe needed will be determined by the distance from the campsite to the septic tank. Set up a laser level. Determine the depth of the drain field (usually 2 to 3 feet deep) using both the topography of the site and the recommendations made by the soils scientist after testing the soils. Use a backhoe to dig a hole large enough to fit the septic tank. Use the laser level to position the outlet hole on the tank to the predetermined depth of the drain tile by adding more dirt to the bottom of the hole or digging a bit more out, as needed. Install the distribution box (if one is required because more than one drain tile is required) and install sewer pipe between the septic tank and distribution box. Use the level to ensure the inlet of the distribution box is perfectly level with the outlet of the septic tank. Use a tape measure to lay out the location(s) of the drain field and mark with flags. Dig a trench 3 feet wide to the prescribed depth in which the drain tile will be located. Use the laser level to ensure the bottom of the trench is perfectly level. Use a front loader to line the bottom of each trench with a 3-inch deep layer of 1 ½-inch gravel. Install the drain tile in the center of the trench. Use the laser to ensure the tile is installed perfectly level. Fill the trench with gravel, covering the drain tile 2 inches deep. Refill the trenches with the excavated dirt, grade smooth and seed the disturbed area to prevent erosion. Draw a map of the site for future reference noting the position of septic tank, sewer line, distribution box and drain tile.